UPDATE: At 7:32 a.m., CPD spokesperson Anthony Guglielmi tweeted, "The area around the shooting is saturated in cameras and detectives are not able to find any evidence of an encounter between the gunman and officers party as of yet. A Police procession will begin shortly to medical examiner.” Guglielmi again referred only to one off-duty officer being involved in the incident. UPDATE 7:57 a.m. — CPD has clarified that one off-duty officer was killed and a second off-duty officer was in the vehicle's back seat, but escaped uninjured. We have updated our report. UPDATE 8:44 a.m.— Chicago police Deputy Supt. Anthony Riccio announced that one person of interest is in custody, but the shooter is believed to still be at-large. Police at the scene of the shooting said the suspects are two black males, one of whom wore a gray sweater, black pants, and a black jacket with a large symbol on the back. The other wore a black jacket with a red hoodie underneath and blue jeans. UPDATE 9:50 a.m. — The Cook County medical examiner’s office has identified the slain off-duty officer John P. Rivera, 23. Rivera lived on the Far South Side. UPDATE 2:23 p.m. — Chicago police said the off-duty officers and their companions were shot in the vehicle after leaving Stout Barrel House, 642 North Clark. An off-duty Chicago police officer was fatally shot as he sat in his car's driver's seat in River North early Saturday. A second man who was sitting behind the driver was critically injured, A second off-duty officer who was sitting in the front passenger seat and a female who was seated on the passenger side of the rear seat escaped unharmed, according to police department sources. A source said the group had been in a nearby nightclub moments before they were shot. 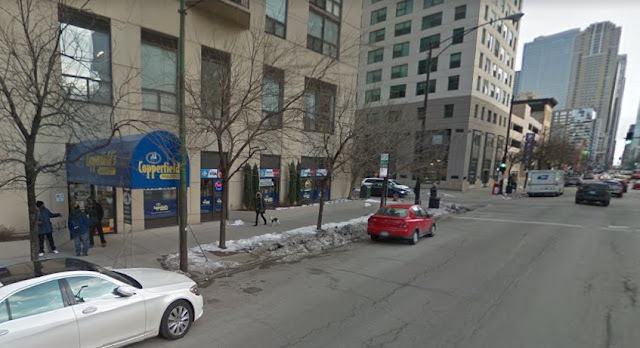 In a statement issued overnight, police said two 23-year-old men were sitting in a parked vehicle in the 700 block of North Clark around 3:29 a.m. when two men approached them and one began firing shots into the victim’s car. The two then fled on foot. One of the victims—an off-duty cop—was pronounced dead at Northwestern Memorial Hospital after suffering gunshot wounds to the chest, arm, and mouth. The second victim suffered gunshots to the chest and arm. He was listed in critical condition at Northwestern, the department said. CPD’s chief spokesperson Anthony Guglielmi said in a tweet that persons of interest were being questioned. There were “no problems, no words were exchanged, no robbery demand, no carjacking demand” before the shooting, said CPD Deputy Supt. Anthony Riccio. One of the off-duty officers in the vehicle is a newly-hired probationary police officer and the second recently completed his probationary period, a department source said. The fatally-injured cops was assigned to the Gresham District, the other to the Harrison District, the source said. This morning's shooting came just two weeks after a double-shooting at nearby Sound-Bar nightclub left a doorman dead and the club's co-owner injured. CWBChicago will update this story throughout the day.